Every so often, a product comes along that seemingly blows all of the others in the same category out of the water. That product in the case of network attached storage devices is the Drobo FS-5. The Drobo is truly a beast of a machine and offers much more storage capacity than almost all of the other NAS devices on the market. While a 2TB storage unit may seem like a lot when you first start backing up your data, you’d be surprised how quickly all of that space disappears when all of the computer users within a household are backing up all of their important media files and documents to a central location. Let’s take a look at what the Drobo has to offer. Most products seem to drop the ball when they have to deal with both Macs and PCs on the same network trying to share files back and forth. The Drobo FS 5, an updated version of the previous Drobo release, is able to manage both Macs and PCs with seemingly no problems at all, allowing for native Time Machine and PC backup without any snags. 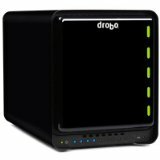 As Drobo describes itself, it has the ability to self-heal. What does that mean exactly? While the unit sits idly, not being accessed by any of the computers or devices on the network, it will actively scan all of the sectors and blocks within the data that’s stored on the drive and mark any of the areas that it thinks could be troublesome or look as though they’re going bad. Then, next time the computers are on the network, the Drobo makes another backup of the data that looked as though it could be going bad just to make sure that everything on the drive stays in tip top shape. The Drobo FS 5 has space for up to 5 independent drives, meaning that you have plenty of space available to you at any given time. In addition to having massive amounts of space, you can set the Drobo to use the extra drives and space for redundant backups. That means that if configured in this way, the Drobo can have 2 drives fail and still run smoothly and keep your data safe. Unfortunately, this is going to have to be our cons section. The Drobo may excel at keeping your data safe and secure, but when it comes to actually getting the data to the device over the network, wired or wireless, things may be a little slow. For whatever reason, NAS devices are notoriously slow over networks and short of shelling out thousands of dollars for professional grade equipment, it’s a fact you’ll have to live with. Apart from the average of about 25MB/s over the network that we were seeing, the Drobo is a phenomenal piece of network equipment. While the price may be a little above what most people are looking to spend, the copious amounts of space and guarantee that your data will stay safe is something you really can’t put a price on.